Under the protocol signed at the London Conference of 1832 on 7 May 1832 between Bavaria and the protecting Powers, Greece was defined as an independent kingdom, free of Ottoman control, with the Arta-Volos line as its northern frontier. The protocol also dealt with the way in which a Regency was to be managed until Otto of Bavaria reached his majority to assume the throne of Greece. The Ottoman Empire was indemnified in the sum of 40,000,000 piastres for the loss of territory in the new kingdom. Otto's reign would prove troubled, but he managed to hang on for 30 years before he and his wife, Queen Amalia, left the same way they came, aboard a British warship. During the early years of his reign, a group of Bavarian Regents ruled in his name, and they made themselves very unpopular by trying to impose German ideas of rigid hierarchical government on the Greeks, while keeping most significant state offices away from them. Nevertheless, they laid the foundations of a Greek administration, army, justice system and education system. Otto was sincere in his desire to give Greece good government, but he suffered from two great handicaps: his Roman Catholic faith and his childless marriage to Queen Amalia. This meant he could neither be crowned as King of Greece under the Orthodox rite nor establish a dynasty.The Bavarian Regents ruled until 1837, when they were recalled at the insistence of Britain and France. Otto thereafter appointed Greek ministers, although Bavarian officials still ran most of the administration and the army. At this time, Greece still had no legislature and no constitution. Discontent grew until the 3 September 1843 Revolution broke out in Athens. Otto agreed to grant a constitution and convened a National Assembly that met in November of the same year. The Greek Constitution of 1844 then created a bicameral parliament consisting of an Assembly (Vouli) and a Senate (Gerousia). Power then passed into the hands of a group of Greek politicians, most of whom who had been commanders in the War of Independence against the Ottomans. Greek politics in the 19th century was dominated by the "national question." The majority of Greeks continued to live under Ottoman rule, and Greeks dreamed of liberating them all and reconstituting a state embracing all the Greek lands, with Constantinople as its capital. This was called the Great Idea (Megali Idea), and it was sustained by almost continuous rebellions against Ottoman rule in Greek-speaking territories, particularly Crete, Thessaly and Macedonia. When the Crimean War broke out in 1854, Greece saw an opportunity to gain Ottoman-controlled territory that had large Greek populations. Greece, an Orthodox nation, had considerable support in Russia, but the Russian government decided it was too dangerous to help Greece expand its holdings. When the Russians attacked the Ottoman forces, Greece invaded Thessaly and Epirus. To block further Greek moves, the British and French occupied the main Greek port at Piraeus from April 1854 to February 1857. The Greeks, gambling on a Russian victory, incited the large-scale Epirus Revolt of 1854 as well as uprisings in Crete. The revolts failed and Greece made no gains during the Crimean War, which Russia lost. A new generation of Greek politicians was growing increasingly intolerant of King Otto's continuing interference in government. In 1862, the King dismissed his Prime Minister, the former admiral Constantine Kanaris, the most prominent politician of the period. This provoked a military rebellion, forcing Otto to accept the inevitable and leave the country. The Greeks then asked Britain to send Queen Victoria's son Prince Alfred as their new king, but this was vetoed by the other Powers. Instead, a young Danish Prince became King George I. George was a very popular choice as a constitutional monarch, and he agreed that his sons would be raised in the Greek Orthodox faith. As a reward to the Greeks for adopting a pro-British King, Britain ceded the Ionian Islands to Greece. At the urging of Britain and King George, Greece adopted the much more democratic Greek Constitution of 1864. The powers of the King were reduced, the Senate was abolished, and the franchise was extended to all adult males. Approval voting was used in elections, with one urn for each candidate divided into "yes" and "no" portions into which voters dropped lead beads. Nevertheless, Greek politics remained heavily dynastic, as it has always been. Family names such as Zaimis, Rallis and Trikoupis occurred repeatedly as Prime Ministers. Trikoupis and Deligiannis dominated Greek politics in the later 19th century, alternating in office. Trikoupis favoured co-operation with Great Britain in foreign affairs, the creation of infrastructure and an indigenous industry, raising protective tariffs and progressive social legislation, while the more populist Deligiannis depended on the promotion of Greek nationalism and the Megali Idea. Greece remained a very poor country throughout the 19th century. The country lacked raw materials, infrastructure and capital. Agriculture was mostly at the subsistence level, and the only important export commodities were currants, raisins and tobacco. Some Greeks grew rich as merchants and shipowners, and Piraeus became a major port, but little of this wealth found its way to the Greek peasantry. Greece remained hopelessly in debt to London finance houses. By the 1890s Greece was virtually bankrupt. Poverty was rife in the rural areas and the islands, and was eased only by large-scale emigration to the United States. There was little education in the rural areas. Nevertheless, there was progress in building communications and infrastructure, and fine public buildings were erected in Athens. Despite the bad financial situation, Athens staged the revival of the Olympic Games in 1896, which proved a great success. Corruption and Trikoupis' increased spending (to create necessary infrastructure such as the Corinth Canal) overtaxed the weak Greek economy, forcing the declaration of public insolvency in 1893 and to accept the imposition of an International Financial Control authority to pay off the country's creditors. Another political issue in 19th-century Greece was the Greek language question. The Greek people spoke a form of Greek called Demotic. Many of the educated elite saw this as a peasant dialect and were determined to restore the glories of Ancient Greek. Government documents and newspapers were consequently published in Katharevousa (purified) Greek, a form that few ordinary Greeks could read. Liberals favoured recognising Demotic as the national language, but conservatives and the Orthodox Church resisted all such efforts. Arvanites are a bilingual Orthodox population group in Greece who traditionally speak Arvanitika, a medieval dialect of the Albanian language, along with Greek. They settled in Greece during the late Byzantine Period and were the dominant population element of some regions of the Peloponnese and Attica until the 20th century. Arvanites self-identify as Greeks. During the Greek War of Independence, many Arvanites played an important role on fighting on the Greek side against the Ottomans, often as national Greek heroes. With the formation of modern nations and nation-states in the Balkans, Arvanites have come to be regarded as an integral part of the Greek nation. 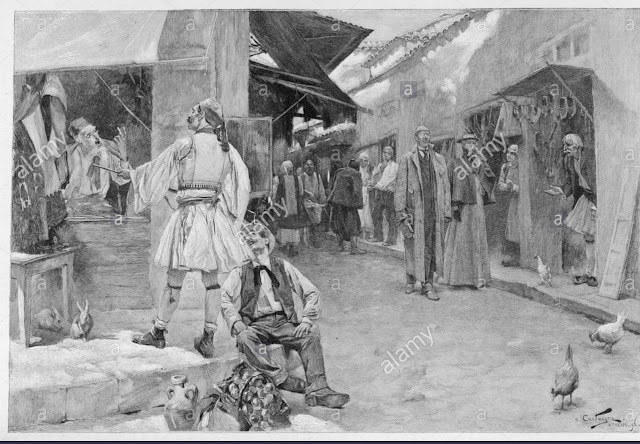 In 1899, leading representatives of the Arvanites in Greece, among them are the descendants of the independence heroes, published a manifesto calling their fellow Albanians outside Greece to join in the creation of a common Albanian-Greek state. During the 20th century, after the creation of the Albanian nation-state, Arvanites in Greece have come to dissociate themselves much more strongly from the Albanians. Regions with a strong traditional presence of Arvanites are found mainly in a compact area in southeastern Greece, namely across Attica, Boeotia, Peloponnese, the south of the island of Euboea, the north of the island of Andros, and several islands of the Saronic Gulf including Salamis. In parts of this area they formed a solid majority until about 1900. Within Attica, parts of the capital Athens and its suburbs were Arvanitic until the late 19th century. 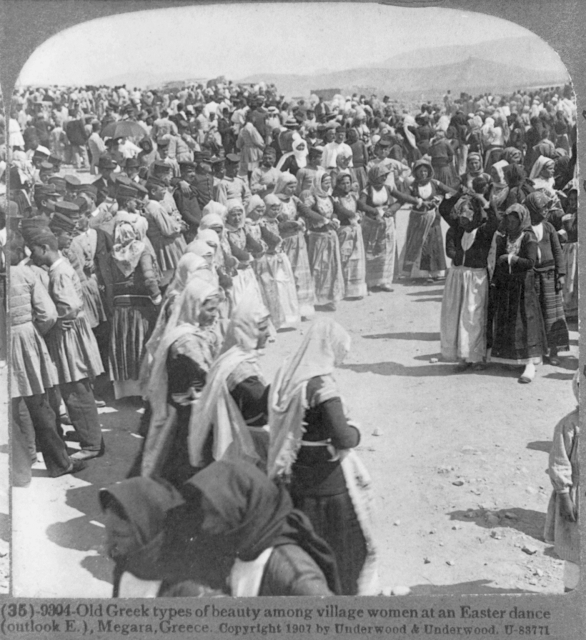 The traditional clothing of Arvanites included distinctive attire that sometimes identified them in past times as Arvanites from other neighbouring populations. 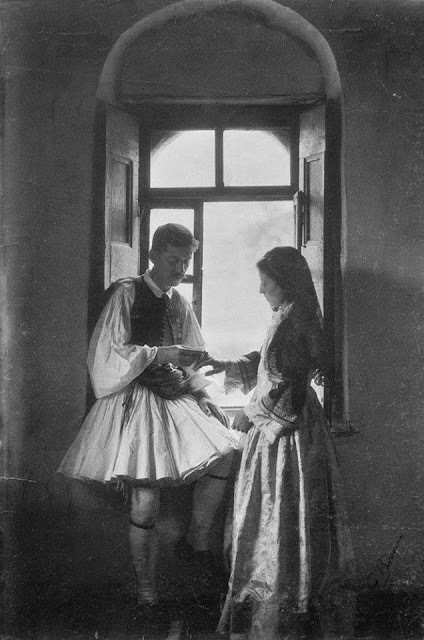 Arvanite males on the Greek mainland wore the fustanella, a pleated like skirt garment or kilt, while those who lived on some Aegean islands wore baggy breeches of the seafaring Greeks. Arvanite women were known for wearing a chemise shirt that was heavily embroidered. They also wore a heavily embroidered foundi or gown like garment that was heavily embroidered in silk and on the mainland the sigouni, a woolen thick white coat. On the Aegean islands, Arvanite women wore silk gowns with Turkish influences. Terms for Arvanite female clothing were in Arvanitika rather than in Greek. Arvanitika shares many features with the Tosk dialect spoken in Southern Albania. However, it has received a great deal of influence from Greek, mostly related to the vocabulary and the phonological system. At the same time, it is reported to have preserved some conservative features that were lost in mainstream Albanian Tosk. Arvanites lived in the countryside of the Greek capital Athens and inside the borders of the first Greek state. They lived in villages in Roumeli (Sterea Hellas) and Peloponnese. Also in near by, bigger and smaller, islands. They where traditional and conservative people living in closed farmer societies keeping the customs and the traditions for centuries. Their morality was very important and very strict. They lived in great families called fares (phares) in Arvanitika. The meaning of this word comes from the Arvanitic word for "ceed" or from Ancient Greek fatria (fraction, family).They supported the right patriotic conservative parties in the Greek parliament and they were loyal to the royal Greek family. They were religious and believed strong in Christian Orthodox religion. Also there where participate in all the national actions to expand the limited borders of the first Greek state. They where fierce fighters and great warriors. They where dynamic people and very stubborn in there opinion. The Megali Idea ("Great Idea") was an concept of Greek nationalism that expressed the goal of establishing a Greek state that would encompass all historically ethnic Greek-inhabited areas, including the large Greek populations that were still under Ottoman rule after the Greek War of Independence (1830) and all the regions that traditionally belonged to Greeks in ancient times (the Southern Balkans, Anatolia and Cyprus). The term appeared for the first time during the debates of Prime Minister Ioannis Kolettis with King Otto that preceded the promulgation of the 1844 constitution. This was a visionary nationalist aspiration that was to dominate foreign relations and, to a significant extent, determine domestic politics of the Greek state for much of the first century of independence. The expression was new in 1844 but the concept had roots in the Greek popular psyche. It long had hopes of liberation from Turkish rule and restoration of the Byzantine Empire. This new state would have Constantinople as its capital: it would be the "Greece of Two Continents and Five Seas". The Megali Idea dominated foreign policy and domestic politics of Greece from the War of Independence in the 1820s through the Balkan wars in the beginning of the 20th century. When the young Danish prince Wilhelm Georg was elected king in 1863, the title offered to him by the Greek National Assembly was not "King of Greece", the title of his deposed predecessor, King Otto; but rather "King of the Hellenes". Implicit in the wording was that George I was to be king of all Greeks, regardless of whether they then lived within the borders of his new kingdom. The first areas to be incorporated into the Kingdom were the Ionian islands in 1864, and later Thessaly and Arta from Epirus with the Treaty of Berlin (1878). All Greeks were united, in their determination to liberate the Greek-speaking provinces of the Ottoman Empire. Especially in Crete, the Cretan Revolt (1866–1869) raised nationalist fervour. When war broke out between Russian and the Ottomans in the Russo-Turkish War (1877–1878), Greek popular sentiment rallied to Russia's side, but Greece was too poor and too concerned about British intervention to enter the war officially. Nevertheless, in 1881, Thessaly and small parts of Epirus were ceded to Greece as part of the Treaty of Berlin. 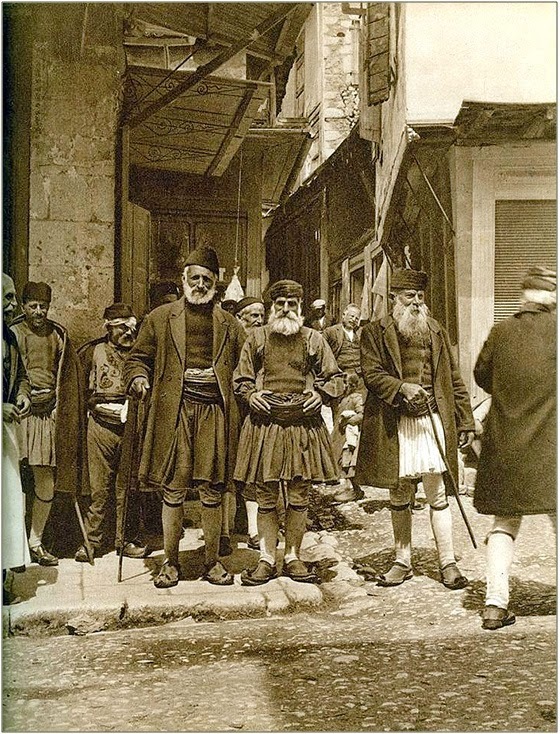 Greeks in Crete continued to stage regular revolts, and in 1897, the Greek government under Theodoros Deligiannis, bowing to popular pressure, declared war on the Ottomans. In the ensuing Greco-Turkish War of 1897, the badly trained and equipped Greek army was defeated by the Ottomans. Through the intervention of the Great Powers however, Greece lost only a little territory along the border to Turkey, while Crete was established as an autonomous state under Prince George of Greece as the Cretan State. Nationalist sentiment among Greeks in the Ottoman Empire continued to grow, and by the 1890s there were constant disturbances in Macedonia. Here, the Greeks were in competition not only with the Ottomans, but also with the Bulgarians, in an armed propaganda struggle for the hearts and minds of the ethnically mixed local population, the so-called "Macedonian Struggle". Αναρτήθηκε από ΕΛΛΗΝΙΚΗ ΙΣΤΟΡΙΑ ΚΑΙ ΠΡΟΙΣΤΟΡΙΑ - GREEK HISTORY στις 7/01/2018 11:16:00 π.μ.